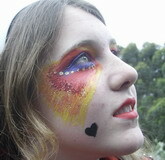 People searching for a face painting design , will find a great selection of pictures for inspiration. 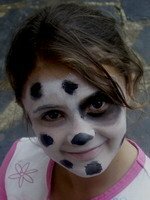 Our website has a great selection of face painting resources, for those starting out and even the professional face and body artists. 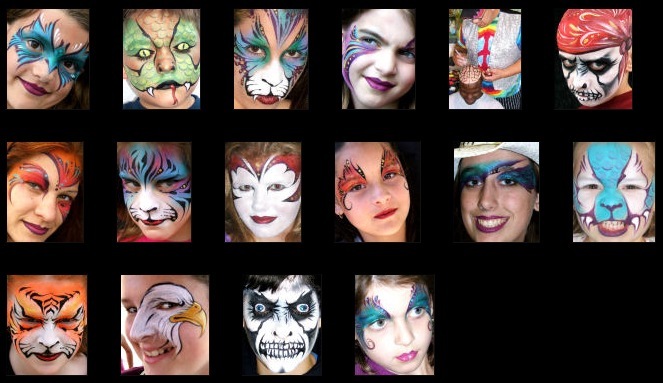 We started a page on Face-Book to follow the face painting designs of many of the top professional artists from around the world. We post our favourites for your inspiration and comments. Below is an example of the news feed that you can follow. 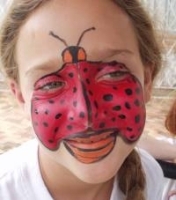 Young children love an animal face painting design. Many kids have pets that they love, and favourite animals that they dote over. 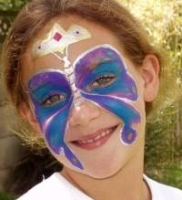 For a processional face painter to find out what animal a child loves is not a difficult task. The real challenge is to transform the child into a tiger or butterfly in a few minutes with the child hyped up and moving. 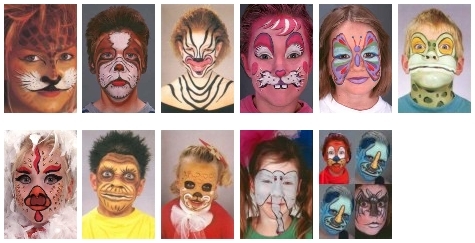 A quick image search will show the most popular animal design. We have found the popular Dutch brand Grimas, has a helpful service, on their website, that shows many of the popular animal designs with step by step images. Click on the images below to see a large selection of animal step by steps. 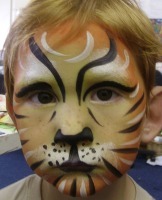 Check out these animal face paint designs done with Grimas face paint. Click on the images, to see lager images from the Grimas web site. 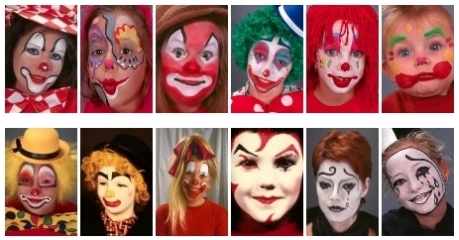 Clown face painting design images are very common all over the world and have been made famous by the numerous circuses and TV programs showing the most prestigious circus acts. 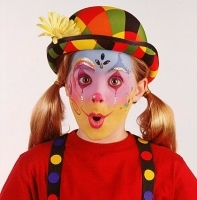 Clown face painting designs can be very simple with only a white face and red nose, to extremely complex designs. 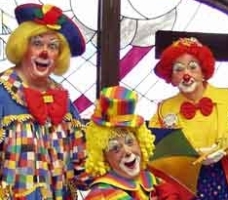 Have a look below at these clown faces done in Grimas face paint. Click on the image below to see larger images on the Grimas website. Kids and adults seem to be more and more interested in the faces depicting faces from horror movies, cartoon figures or Halloween themes. 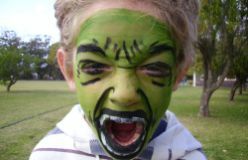 Horror face painting ideas have become more and more popular as it seems to be a sign of the times that generally there is a fascination with the dark and evil. Also there is a fun element as well in scaring people with a scary face. 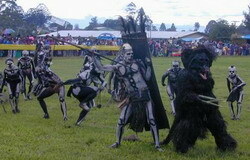 This next image is from the Simbu of Papua New Guinea. The skeleton type figures are hunting the wolf/bear looking creature. The design below is by Lynne Jamieson, click on the image to see more of her work. 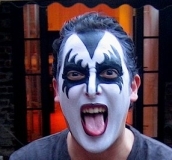 Face painting design and face paint makeup, in the theater are one of the primary ways open to the professional face painting, artists to create the illusion of a particular character. The made up face then helps the actor to become the character and helps the audience to believe the actor. A well made up face along with the costumes ,set design and lighting, creates a powerful environment for the actor to perform. 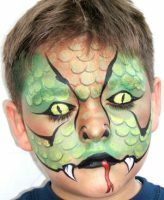 Professional face painting products enable the artist to create ageing and youthfulness, depending on the roll the actor has to perform. 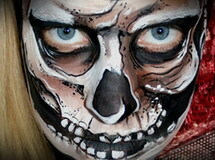 To Buy Theatrical Makeup Kits see our shop online. Click on the image below for larger pictures from the Grimas website. 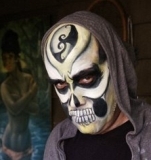 Mark Reid is a world-renowned face and body artist, famous for his ability to transform the human face and form into works of fantasy and illusion. View the gallery below to see examples of his awe-inspiring creations. Click on the Images below to see more images from the gallery on his website. Since skin reflects light and this may draw an enemy's attention. 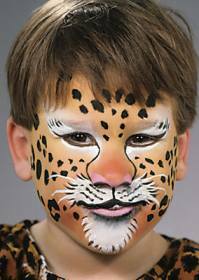 Face painting design used to cover the skin that reflects light because of the natural oil or sweat even from dark skin. 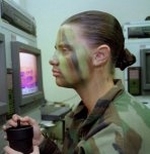 Camouflage Face Paint is used thus to cover and camouflage the skin. Soldiers mormaly apply the paint in teams or work with a buddy in pairs to help each other. A two-three color combination of paint is applied in an irregular pattern. Shiny areas (forehead, cheekbones, nose, ears, and chin) are painted with a dark, color, and shadow areas (around the eyes, under the nose, and under the chin) are painted with a light color. In addition to the face, exposed skin on the back of the neck, arms, and hands are also painted. 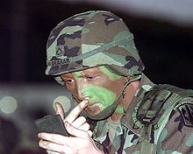 Palms of hands are not normally camouflaged if arm-and-hand signals are to be used. 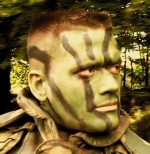 The three standard camouflage face paint sticks are: loam and light green for all troops in areas with green vegetation; sand and light green for all troops in areas lacking green vegetation; and loam and white for all troops in snow covered terrain.